Street protests are in from Cape to Cairo and Madrid to Moscow, these days not a week goes by without news that a massive crowd has amassed in the streets of another of the world's big cities. The reasons for the protests vary (bad and too-costly public transport or education, police abuse, public fund abuse Often, the grievance quickly expands to include a repudiation of the government, or its head, or more general denunciations of corruption and economic inequality. They deliberately provoke the police and take photos while they are being restrained so that they put it on their profiles and face book to show that they are heroes. No plans or follow ups of the demonstrations. Notable exceptions of course exist: In countries where the demonstrators are serious not traitors on the edge like beards. The problem is what happens after the march. The hodgepodge groups that participated had no formal affiliation with one another, no clear hierarchy, and no obvious leaders. But social networks helped to virally replicate the movement so that the basic patterns of protesting, fundraising, communicating with the media, and interacting with the authorities were similar from place to place. The same message echoed everywhere: It is unacceptable that funds raised are concentrated in the hands of an elite 1 percent while the remaining 99 percent can barely scrape by. Yet the ones who benefit are pretenders who provoke the police for photo shopping. Such a massive, and seemingly well-organized initiative should have had a greater impact. But it didn't. Though the topic of economic inequality has gained momentum in the years since, in practice it is hard to find meaningful changes in public policy based on demonstrations By and large the Demonstrations have now vanished from the headlines. In fact, government responses usually amount to little more than rhetorical appeasement, or a polite soft restraint by the riot squad and certainly no major political reforms. MDC president tsvangidiot for example, publicly validated the frustrations of those who took to the streets of our country, and promised that changes would be made, but those 'changes' never materialize when he was the PM The reaction of tsvangirai to the protests in his party was more aggressive. He accused the other leaders and protesters of plotting a sophisticated conspiracy against him, and tried to elbow them out by violence Why? How can so many extremely motivated people achieve so little? One answer might be found in the results of the social media In need to discuss they created a What App group to protest the death of democracy and perceived deteriorating conditions of economy That was the extent of the experiment. There was never a plan to solve the situation but a recruiting drive by other parties and that admin simply wanted to show how easy it was to create a relatively large group using social media. In today's world, an appeal to protest via Twitter, Facebook, or text message is sure to attract a crowd, especially if it is to demonstrate against something—anything, really—that outrages us. The problem is what happens after the march. Sometimes it ends in violent confrontation with the police, and more often than not it simply fizzles out. Behind massive street demonstrations there is rarely a well-oiled and more-permanent organization capable of following up on protesters' demands and undertaking the complex, face-to-face, and dull political work that produces real change in government. Before the Internet, the tedious work of organizing that was required to circumvent censorship or to organize a protest also helped build infrastructure for decision making and strategies for sustaining momentum. Now movements can rush past that step, often to their own detriment." The way people run social media reflects on the way they will run a real face to face gathering If people realise the school boy prefect tendencies they dissect into your shallow and empty brains. Our protests never work now because the admin think they are group leaders in grade two class and being admin defeats the purpose of the group in the first place. The zeal to be relevant ends up diverting the noble idea you started on and exposes the idiocy otherwise covered by make up As Obama once said a pig on make up. It is sad that a right of an individual is infringed because it has been abused. Any authority cannot sit and watch as the country is reduced to ruins by the demonstrators. There is no reason whatsoever to burn the infrastructure and destroy the country. Who will take over the ruins ruined by the demonstrators. It should be made clear that your freedom starts exactly where your freedom ends. So the end must be defined and be understood by both. Looting is not demonstrating. Looting is simply barbaric and inhuman. If I may borrow the correct words from Nelson Chamisa. He called those who demonstrate to be Stupids. How prophetic was he. 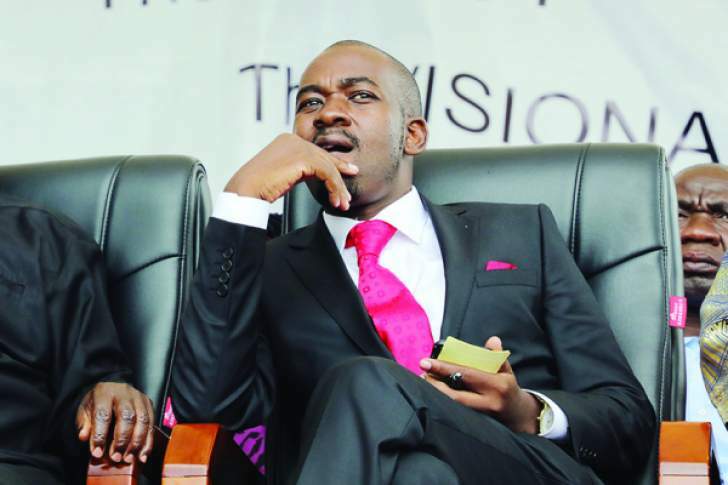 People who destroy their future because they are angry with today are according to Nelson Chamisa Stupids. God have mercy. We will learn soon that demonstrations produce nothing. They just bring up injuries or deaths. No leader will give an ear to hooligans who are bent on destroying property. It must be noted that all demonstrations of today were mainly in towns. It is not a secret that most town folks are MDC party members. So their demonstration was politically motivated. We should stand up and protect our nation frm the thugs who are looting the country.